Enjoy 5 types of jets including full body, full spray with massage, and massage only. You can even decide if the water flows from the showerhead, the handshower or both at the same time! Unique, ergonomic and highly affordable, this double showerhead by DELTA is ideal for anyone wanting to upgrade a bathroom’s look in just a few minutes! WaterSense certified, it will allow you to enjoy multiple types of jets including full body spray, massaging spray, full spray with massage or shampoo rinsing spray. Plus, you can use the pause feature to reduce the water flow to a minimum when suitable. Original, ergonomic and functional, this product from the In2ition shower faucet collection by DELTA is ideal for anyone wanting to upgrade a bathroom’s look with a modern touch! WaterSense certified, this product consists of a handshower that can be detached from the showerhead. Getting your hands dirty in the kitchen is a good thing, but washing off your hands shouldn't make a mess of your faucet. The pull-down faucet features Delta's Touch2O technology, allowing you to turn the faucet on or off with the simple touch on any part of the handle or faucet. Environmentally friendly, the hand shower features two types of jets, including one with a reduced water flow, as well as an automatic shut-off after 4 minutes to help reduce your water consumption. 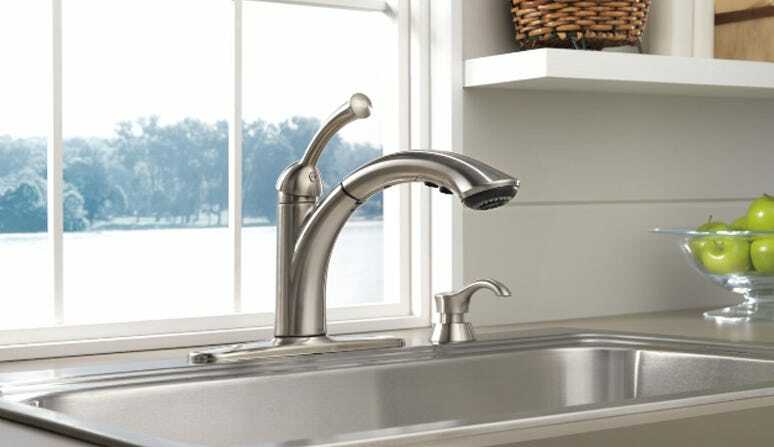 Simplify clean-up time with this touch-activated kitchen faucet! 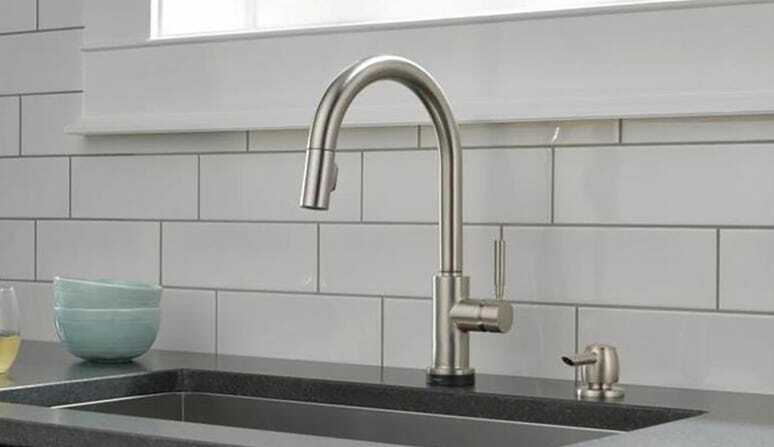 This pull-out kitchen faucet feature's Delta's Touch2O technology, allowing you to turn the faucet on or off with the simple touch on any part of the handle or faucet. When in use, the integrated LED light indicates the waters temperature, changing from blue to magenta to red as the temperature rises. Designed to fit a standard shower arm, the HydroRain Two-in-One Showerhead installs in minutes. It will provide you with a luxurious shower experience and complete control over your water: use either one of the showerheads on its own or both together. How does the HydroRain 2-in-1 Showerhead work? This product features a higher showerhead, which can run separately from or simultaneously with the lower head, giving you the warmth and flexibility of two streams of water at once. How do I switch between the high showerhead and the lower one? With a diverter lever positioned on the front of the showerhead, you can set your HydroRain 2-in-1 Showerhead to one of three options: high and low showerheads combined, high head only, and low head only. This diverter also lets you choose 5 different spray options on the showerhead. How do you install the showerhead? The HydroRain 2-in-1 Showerhead is a quick and easy way to upgrade your shower. Simply remove your current showerhead and replace it with this one. There’s no need to go behind the wall to enhance your everyday shower. What’s the purpose of the pause function? The pause function on the showerhead reduces the water to a trickle, allowing you to conserve water while doing tasks such as lathering up or shaving. Can I re-position the HydroRain 2-in-1 Showerhead after installation to fit my shower space? The HydroRain 2-in-1 Shower Head allows for maximum flexibility and coverage after installation. The high head pivots 40 degrees while the lower showerhead can move 30 degrees in any direction. Will the HydroRain 2-in-1 Showerhead work on a standard shower arm? Yes. The HydroRain 2-in-1 Showerhead installs on any standard shower arm, similar to a standard showerhead. This can be done in minutes and no tools are required. What are the key benefits of the HydroRain 2-in-1 Showerhead? The HydroRain 2-in-1 Showerhead creates a spa-like shower experience without having to redesign your shower. The overhead shower creates a soothing rainfall feel with 40 degrees of motion for maximum coverage. The shower head includes multiple powerful spray options to rinse shampoo or give you a relaxing massage.